died: September 18, 2002 obituaries. A.B. in mathematics from Fisk University in 1953; M.S. at the University of Wisconsin in 1954. Etta Falconer was born in Tupelo, Mississippi as Etta Zuber, the second of two children (an older sister Alice) born to Dr. Walter A. Zuber, a physician and Mrs. Zadie L. Montgomery Zuber, a musician who had attended Spelman College. She attended public schools in Tupelo, graduating from George Washington High School in 1949. She attended Fisk University, graduating summa sum laude with a major in mathematics and a minor in chemistry (1953). She was also inducted into Phi Beta Kappa. Immediately following graduation from college, she attended the University of Wisconsin at Madison where she earned the MS degree in Mathematics (1954). "Can you imagine what it was like for a 19 year old Black female from Tupelo, Missippi who had been immersed in segregation for all her life to attend the University of Wisconsin? I underwent a major culture shock. ... I gravitated to students from Africa, a roomate from Thailand, and an office-mate from India, who was the only person to whom I could ask a mathematics question." Dr. Falconner was taught and inspired by Evelyn Boyd Granville and Lee Lorch. She has said (1995), "My entire career has been devoted to increasing the number of African American women in mathematics and mathematics-related careers." Etta Zuber began her teaching career in 1954 at Okolona Junior College in Okolona, Mississippi where she remained until 1963. High School in Chattanooga, TN. While working at Okona Junior College, Etta met and married Dolan Falconer. After a few years of teaching at the junior college/college level, she entered Emory University in Atlanta. In 1969 she became the 10th African American woman to earn a Ph.D. in Mathematics (from Emory University) with an Algebra dissertation entitled: "Quasi group Identities Invariant under Isotopy." Dr. Falconer was Assistant Professor of Mathematics at Spelman college (1965-71), Assistant Professor of Mathematics at Norfolk State college (1971-72), and Chair and Associate Professor of the Department of Mathematics Spelman College). Additional formal studies include earning a Master's Degree in Computer Science from Atlanta University (1982); attending the University of Illinois-Champange-Urbana during the summers of 1962-1965 and during the 1964-65 academic year at a National Science Foundation (NSF) Teacher Training Institute; and she attended the University of California-Santa Barbara (summer of 1980) - a workshop on "The Integration of Micro-Computers into the the Undergraduate Mathematics Curriculum." Coupled with her lifelong commitment to learning is her lifelong commitment to assisting and providing mathematics and science education for aspiring youth, especially African American Women. Professor Falconer was chiefly concerned with the preparation of undergraduates for success in graduate school. In 1987 she introduced the NASA Women in Science Program started in 1987, NASA Undergraduate Science Research Program, and the College Honors Program at Spelman College. From the first class of NASA graduates, five entered graduate programs in applied mathematics (Brown University), mathematics (University of Maryland), operations research (Georgia Tech), chemistry (University of Florida), and medicine (Baylor College of Medicine). With great sadness and a sense of deep personal loss, I inform you of the death of Dr. Etta Zuber Falconer on September 19, 2002. Possessed of great talent, limitless courage, uncompromising honesty, enormous kindness, remarkable insight, quiet modesty, she made enduring selfless contributions. We are all the poorer by her death, the richer by her life. In 1995, Etta Zuber Falconer was awarded the AWM Louise Hay Award given to celebrate outstanding achievements in mathematics education. In response to being awarded the Hay award, Falconer said, "I have devoted my entire life to increasing the number of highly qualified African Americans in mathematics and mathematics related careers. High expectations, the building of self confidence, and the creation of a nurturing environment have been essential components for the success of these students. They have fully justified my beliefs. Perhaps the most rewarding moments have come when younger faculty have undertaken the same goal and have surpassed my efforts - reaching out to the broader community to help minorities and women achieve in mathematics." In 1999, Falconer was elected by the Council of the American Association for the Advancement of Science as a fellow of the AAAS. 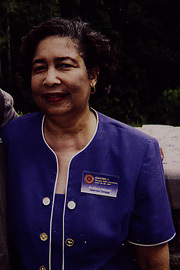 In 2001, Etta Falconer won, along with Dr. James H.M.N. Henderson from Tuskegee, the AAAS Lifetime Mentor Award. Dr. Falconner has author several papers on the education of minorities in mathematics. Those most recent is The Challenge of Diversity, DIMACS 34 (1996) American Mathematics Society, 169-182. Etta Falconer had a passion for math and science. Through it, this dynamic teacher-administrator helped transform Spelman College into one of the leading destinations for black women seeking careers in those fields. "Because of her, we are now considered a model institution for excellence in science," said Dr. Sylvia Bozeman of Decatur, a Spelman math professor and former chairman of the math department. Dr. Falconer was teaching math at Howard University when her husband, Dolan P. Falconer, was offered the position of basketball coach at Morris Brown College. He accepted, and the family moved to Atlanta in 1965. "Mother walked up to the head of the math department at Spelman, told him she needed a job, and he listened to her," said her son, Walter Zuber Falconer of Atlanta. That was the start of a 37-year career at Spelman. When she arrived, it was primarily a liberal arts school. The Mississippi native started a program to promote careers in science and engineering, a Health Careers Society to help Spelman women get into medical and dental schools, a computer science program, and a summer program with the National Aeronautics and Space Administration. "When she hired me in 1974, only about 10 percent of the women at Spelman majored in science," said Dr. Bozeman. "Today a third of our students major in science, mathematics or engineering." Etta Zuber Falconer, 68, of Atlanta died Thursday of complications from pancreatic cancer at Crawford Long Hospital of Emory University. The funeral is 3 p.m. Monday at Christian Fellowship Baptist Church in College Park. Alfonso Dawson Mortuary is in charge of arrangements. Dr. Falconer's specialty was abstract algebra, and her expertise was much in demand. "She was recruited by Harvard and Yale, but gave up a tremendous career in research because her passion was to teach African-American women and to give them an opportunity for careers in the sciences," said her son. "She was a wonderful mentor who followed her students' progress after they left Spelman and went to graduate school," said Dr. Bozeman. Sylvia Baldwin worked for Dr. Falconer as her secretary. Dr. Falconer encouraged her to take classes at Spelman and earn a college degree. "As a result of that gentle yet insistent push and with Dr. Falconer's support, love, mentoring and goading, I began what has proven to be a life-changing academic career," wrote Ms. Baldwin in a recent letter to the Falconer family. Ms. Baldwin earned a master's degree in theological studies and ethics at Harvard University. She is now applying for a Ph.D. program in American studies. "I am still perplexed, however, as to how Dr. Falconer saw in me what I had not seen in myself," she wrote. In February the American Association for the Advancement of Science presented Dr. Falconer with its Mentor Award for Lifetime Achievement. Survivors include another son, Dolan P. Falconer Jr. of Atlanta; a daughter, Alice Falconer Wilson of Milledgeville; and seven grandchildren. The State University of New York at Buffalo.